The future of your business is determined by good relationships and healthy interactions with your customers. To mark stability in your business you need new customers more and more. There are some programs which can manage your business in the better manner. They are known as CRM software. Here the word ‘CRM’ stands for ‘Customer Relationship Management’ which means such software that can help in building a benign relationship with your customers. CRM software help in retaining all the data like contact information, phone, email or social media interaction details of your valuable customers. After analyzing these data, you can categorize the customers and determine your prospective buyers. Such practices turn into the great opportunities to generate revenues. To make your customer relationships strong, you need to follow the list of the top CRM software, whose assessment is based on thorough research and these CRM software will be among popular trends in 2017. It offers sales teams a single and centralized platform from which they can manage leads, sales pipeline activity & follow-up with clients. Along with CRM features like email automation, sales automation, and lead management, it has now made lead nurturing easier than ever before by introducing follow-up reminders, which doesn’t allow the sales team to miss any lead. It also seamlessly integrates with 1000+ applications like MailChimp, Quickbooks, Slack and many more. 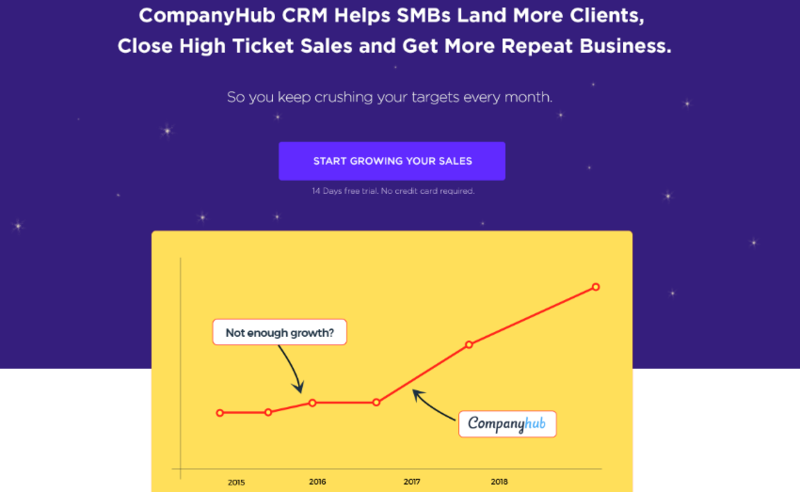 By incorporating email tracking, email scheduling, and reporting technology, CompanyHub aims to deliver a user-friendly CRM solution at an affordable price. The entire sales automation suite will cost you just $24 per month user/per, check their pricing page for more information. There’s also a 14 day free trial period. Infusionsoft is designed for small businesses and medium-sized sales. This software was awarded for its key automation features and goal-oriented platform. It has been used by thousands of industries from health care to hospitality. Easily execution of management tasks, such as project management, email marketing, and billing; enrich its ability to grow sales and take leads. Infusionsoft allows you to centralize your customer interaction details and everyday activities in one location at a small-business-friendly price. Web CRM is one of the Best CRM Software that helps small as well as large businesses to grow in an effective way. It is fully optimized for mobiles and provides the ease to integrate with various Google apps like Google Calendar, Google Contacts, and third-party systems. Web CRM is available in multiple languages with the highly visual platform to navigate the data. Due to its harmony with all business systems (including MailChimp, Zoho CRM, Dropbox ) and flexible pricing plan, it leads our CRM software category. Insightly is the best CRM Software for microbusinesses that provides one of the most affordable CRM solutions. With over 500,000 users worldwide its enterprise-level modules are suitable for multi-level organizations also. Its key features include contacts and tasks management, an overview of sales, collaboration with team members and improvement in interaction with customers. It holds a high position in CRM software category due to its flexibility to support Kindle, iOS, and Android mobile platforms and ability to integrate with popular applications be it Gmail, Evernote, MailChimp, and Office. Zoho is a robust CRM software for both small and medium-size enterprises. Without compromising its competence, it is the best free CRM software with dozens of tools. Its core functionalities include contacts management, email marketing, reporting, simplified payment process, easy tracking of projects and leads. If you want to extend its working ability, just integrate it either with main Zoho productivity products or with other popular applications like Microsoft Outlook, MailChimp, QuickBooks and Google apps. It is also compatible with tablets and smartphones, hence allowing you to access your data anytime or anywhere. With its simple user interface (UI), Base CRM is really very helpful in improving your business relationships, even if you are a beginner. Generating successful leads, growing sales productivity, outstanding customer management, reporting, the ability to store and synchronize all emails and call records of your customers and a devoted team with experience; are the salient features of Base CRM. Although, you may find Base CRM difficult to integrate with some third-party apps and business systems, yet small businesses which are willing to organize their sales and track leads at affordable prices, Base CRM is a very good option. If we take its great customizing ability into account, Apptivo provides the great customer relation solutions. If you have started a new business, you may require the database in simpler form; on the other hand, to run an already established company, you may be looking for an automation feature. Apptivo CRM contains all these functionalities with its unlimited customizable features. Activity tracking, managing sales pipeline, ability to combine contacts and successful lead management are among its major features. Its price starting at just $10 per month per user makes it very affordable too. 1. In ERP category, it beats everyone else as it was designed one of the first enterprise resource planning (ERP) systems. Its cloud-based Software-as-a-Service (SaaS) apps allow you to work always on the latest versions means they don’t have version numbers. 2. In general ledger accounting feature it is equivalent to Intacct but its slightly complex feature prevents it from taking lead in this category. 3. In customer relationship management (CRM) category, however, it does not have so much depth as compared to Salesforce and Zoho CRM; still, it has some core CRM features including customer data management, sales force automation, prospects nurturing and maintaining customer loyalty. NetSuite extends its functionality to the mobile devices with its ‘The NetSuite for iPhone’ application. AmoCRM is a powerful sales management solution with a great user experience. It is helpful for the teams to track their performance and progress while moving towards measurable targets. You have access to various communication tools in one instance so that you can automate your sells and meet your CRM goals. It is a cloud-based customer relationship management solution hence you don’t need to install anything directly on your system. Its easy-to-navigate and information management system let your employees help in tracking potential customers. A dedicated mobile app and its capacity to integrate with the third-party apps is always an advantage. Having all the necessary basic CRM features, HubSpot is best suited to the beginners, mid-market industries or large businesses. It provides you the best-integrated platform to integrate with the popular apps like Salesforce, Microsoft Dynamics, and Zapier, that is too without paying any cost. Its primary feature includes saving your valuable time while performing repetitive marketing tasks and automatically synchronizing data from different sources of communication such as phone calls, emails, and social media channels. It has a single, detailed dashboard that is helpful in monitoring all the company activities and tracking each aspect of your sales pipeline. Due to its flexibility to meet the individual needs, it has got a certified, premier Google partner status. Thank you for these great resources. It will help to manage the various activities and will improve the interaction with customers. Good read thanks for sharing. We hope to be on the list in the next couple of years; swj-ent.com. Keep up the good work! Great article! If you plan an update for 2018, please consider including Bitrix24. We are a free CRM with unlimited records!, a project management and collaboration platform. We are totally free for teams up to 12 users and we are currently used by 3+ million small businesses. Bitrix 24 is great for startups!